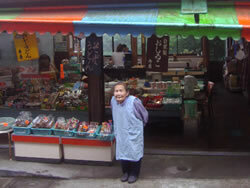 Kotobuki-ya sells homemade oshiruko, sashimi konnyaku, ramen and more. Located right next to Musashi Mitake-jinja Shrine. 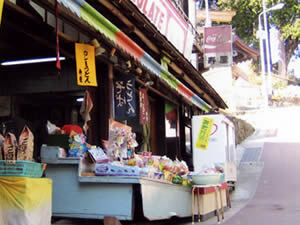 This small shop is the closest of all to Musashi Mitake-jinja Shrine. Its windows provide views to the scenery of the changing seasons. We invite you to stop by on your visit to Mitakesan to experience heartfelt hospitality and modest, homemade food. 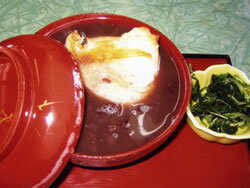 The elderly owner pours her heart into making oshiruko sweet red bean soup every day. Oshiruko re-energizes tired hikers, yet warms and relaxes as well. 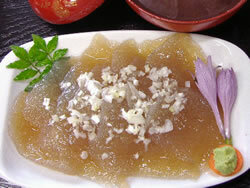 Enjoy the homemade taste of fresh sashimi konnyaku, made with the utmost effort from balls of konnyaku jelly. An old-fashioned, refreshing, soy-based ramen.